Mek Full 3D AOI Systems are designed to detect every measurable solder and component defect pre-reflow and/or post reflow soldering. Full 3D metrological & imaging AOI is achieved by measuring all 3 dimensions (X, Y and Height). The Mek ISO-Spector provides a complete height profile of the entire PCB and a simultaneous 2D scan of that same PCB. This combined 2D and 3D scan includes areas where no components are placed. The height measurement includes the solder joints of the tiniest components, pins, and solder joints of the finest pitch SOP’s and QFP’s. We are able to accurately measure heights of even shiny and reflective cylindrical shaped components with many different testing possibilities. Most “Full 3D” manufacturers are only able to selectively measure heights of some uniformly shaped components for simple coplanarity tests. Here at Mek we call that Selective 3D. In high volume production environments, it is essential that any AOI system(s) placed in the production line is not generating false defects, while identifying actual process defects without the need of an operator. Mek 3D AOI systems excel in this type of inspection. Off-line programming, unique for a full 3D AOI system, further maximizes productivity by allowing for program creation off the factory floor. 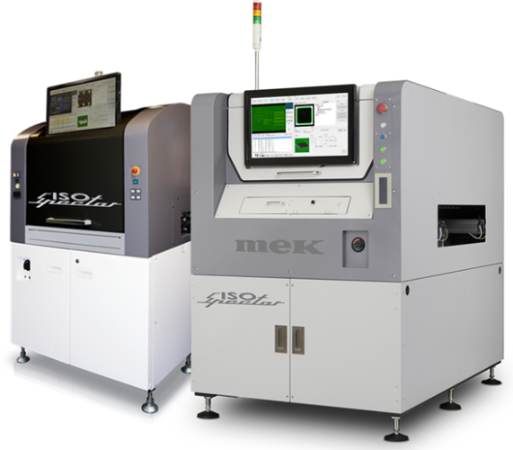 For full 3D solder and component measurement, Mek has different inline AOI solutions to suit any production line, depending on maximum PCB dimensions, minimum component size to be placed and single or dual lane line requirements. There is always a Mek 3D AOI solution. ISO-Spector SL510, inline 3D AOI system for larger boards.